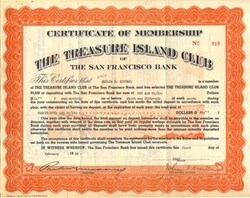 Beautiful certificate from the Treasure Island Club of The San Francisco Bank issued in 1938. This historic document was printed by The San Francisco Bank and has an ornate border around it. This item has the signature of the Company's Officer and is over 71 years old. Prepare now to fully enjoy the Golden Gate International Exposition in 1939 by becoming a member of The Treasure Island Club. By so doing you will have ample funds to see and enjoy the interesting and exciting things that the Exposition will have to offer. The Club offers 3 easy plans to save. Call or write any office of the Bank.